Our next great typo that changed history comes from the world of physics. Yes, the BIG BANG THEORY was actually a typo. It should have been the BIG BONG THEORY but the dope-smoking “scientists” that formulated it back in the 40s were never that attentive to the proper use of vowels. Of course, their theory is that they could get really high if they only had a scientifically created device to deliver the smoke in a way that made only those with serious addiction problems not choke when ingested. Eventually, the bong was created and in a parallel to the Big Bang Theory, continued to get created again and again and again despite governmental agencies best efforts to eliminate it. HA! Mr. Peabody set the dials to 13,700,000,000 B.C.E. + 1 second...! And don't forget th' hookah! First glance at the pic; I thought it was Sally Fields in a role repraisal~HA! "The Flying Nun", indeed! Love those Bongs and Hookahs. What can I say, I excelled in science. Well at least I think I did, although those days are kinda foggy, or is it cloudy. Yeah, smoke does make a cloud, so cloudy it is. You know that after the votes are counted in Novemeber, I could bring out my bongs and hookahs again. I really do like that fruity tobacky. Makes me feel closer to those kooks trying to kill us all. I see them all smoking their hookahs while planning their latest "man-attack". Screw being Politically Correct. They are freaking terrorists, scum of the earth, sissyfied boys, mental cases who are cowards. 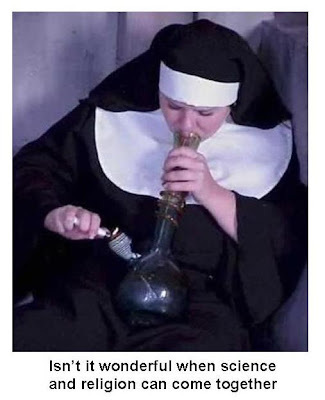 Wow, I need to use my bong now so I can think of some more scientific names for these freaks. Are you telling me that Alice's Caterpillar created the universe? Hmmmm... That would explain a lot. You can also calculate the age of VE by the version of Bang a Gong he has on his MP3 player. And I always thought it was a 50s Beatnik thing. You know, the big bongo theory? For a minute there I thought you were unemployed again. Then I put down the bong, looked at your history and saw you had only posted twice this week....so far. I was just a bit concerned. Too much bloggin means not doing enough work. I should know. I don't work. As for Big Bong Theory, it is the only explanation for some of the wild ideas physicists come up with. "It must be true, the math works." Yah, when you're stoned out of your mind. Subby – Yes, that would be an excellent time to buy real estate…get to it before anybody else! Mrsupole – Is there a correlation here between scientists and terrorists (other than the bong)? Roy – That’s almost as accurate as carbon dating (and won’t make the wifey-poo all jealous wondering who ‘Carbon’ is and why I’m dating). I have the T-Rex version on my MP3 player, thank you very much. But interestingly, I have the Sonic Youth’s version of “Superstar” on it too, not the Carpenters version. Nonamedufus – They were already stoned so they didn’t realize the theory had already been invented and typo’d before them! Incredible woody - I'm the Dude. So that's what you call me. You know, that or, uh, His Dudeness, or uh, Duder, or El Duderino if you're not into the whole brevity thing. My time machine doesn't go back that far anyways. It was made by a fundamentalist Christian and only goes back 10 thousand years. Well that explains all those "far out" theories those wild, wacky, scientists have. Groovy. That's what they used to call plate faults before some hallucinating German guy said: Nein! Tectonic! Tectonic! I prefer Groovy Plates to Tectonic Plates. That's Sister Mary Teresa, my third grade teacher. that picture is great. love it. Jaime – Pretty much sums it up! I tried out the Big Bong Theory a couple of times... but that was such a long time ago.